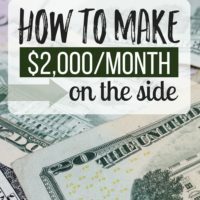 30 Side Hustles That You Easily Can Start Today! 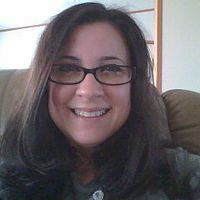 This is a guest post from fellow blogger and my good friend, Diona Culbertson of Mommy Ways to Win. Times are tough right now and the bills aren't going away. 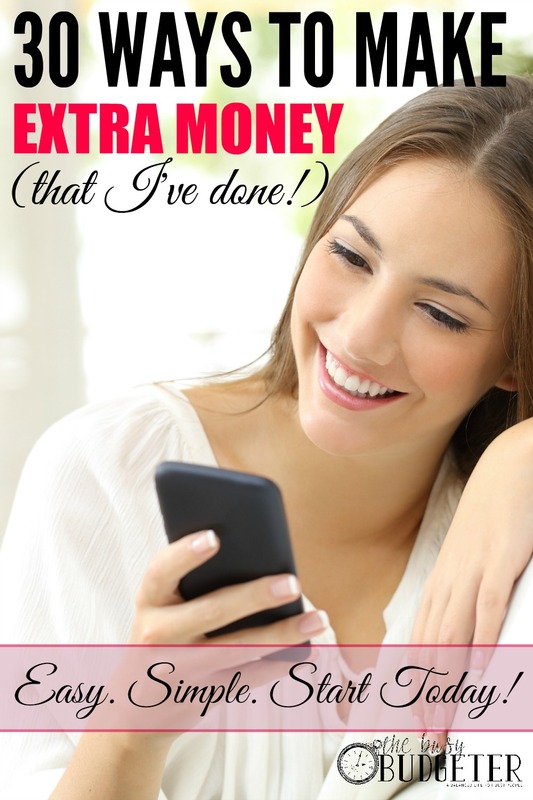 You're probably wondering what else you could possibly do to stretch your dollar and make that paycheck last just a little bit longer. I'm going to tell you exactly what you can and should do. Here are my best 30 ways to work at a side hustle and start them today. Each suggestion I give you is a job that I have already done, with the exception of six which were just too cool not to list. I wouldn't ask you to do something that you need four years of college because I want you to start one or more of these jobs today. Yes today! You can do it, I have faith in you. Pet Sitting – You must love or at least like animals. Water, food, walk, it’s that simple. House Sit – An empty house is a target for thieves. Get the mail, newspaper turn on the lights. Baby Sitting – If you already have children then this will be easy, the real money is when parents need a sitter for their date night. Night Nanny – Yes, this is a thing. 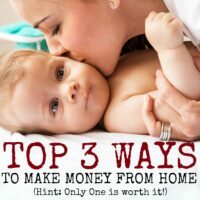 Tired parents (of multiples especially) will pay big bucks for you take care of the baby/babies while mommy and daddy sleeps. Elderly Care – There's a variety of assistance that they need. Lawn Care – Mow the grass, weed eat, rake. Clean Gutters – You’ll need a ladder and nerves of steel. Tree Trimmer – If this isn’t a small job, don’t be a hero. Yes, I’ve done this before. Janitor – Businesses need it and you can even do it overnight. I was 9 months pregnant working it as a side job, don’t be above it if you need the money. Car Detailer – There is money to be made here especially starting in the Spring. Virtual Assistant – This is what I do now, find out how you can too HERE. Blogger – This is becoming the #1 money maker for folks who like to write, find out how to start one HERE. Freelance Write – All those stories you read in magazines, someone like me is writing them, find out how you can start writing too HERE. Cook – Freezer cook for someone who cannot cook for themselves, elderly, new moms, busy folks. This is easy, it’ll take you one day to do it all. Learn more by reading up on $5 Dinners. Bake – Sell those yummy cookies, pies and cakes you love baking. Wedding cakes are where the real money is at. Learn more by reading this post. Paint – Outside painting is harder than inside painting, but if you don’t mind the mess there is someone’s money screaming “take me”. Wallpaper – If this isn’t your thing don’t start learning how to do it on someone’s else’s wall. It’s tricky to hang wallpaper which is why people pay someone to do it. Garage Sale/Ebay/Craig’s List – Sell your own undated stuff or buy someone else’s stuff and sell it for a profit. Etsy – Are you a craft-lover? Get on there and start making that money! Not familiar with Etsy, find out what it is HERE. Seamstress – My hat is off to ya if you can sew, I can’t. Let people know you can hem pants, most guys need the service. Take in Laundry/Iron – This might be a big-city thing but people still pay to have it done, you’ve already got the washer and dryer. Photography – Love snapping pictures? Little kids and weddings are huge “money in your pocket” jobs. Have you looked at Pinterest lately? Tutor – Understand math or Greek Mythology? Someone’s mom will hire you. Driver – Yes, this is a real job. A lady I know from Northern Virginia had a driver help get her 3 kids to their after-school activities. Woodworking – This is how my hubby makes extra money. I’ve never tried it myself. Deliver Newspapers – Hey, the whole family can help do this one. My father had a small newspaper business when I was little, we all helped. Party/Wedding Planner – You must be detailed orientated and love planning events. Now you’re asking yourself how in the world can you find customers. Here’s how you can find them and it’s all free advertising. You only have to be willing to give your full name and phone number. Facebook – They’re all your family and friends anyway. Update your status daily that you’re looking to do whatever odd job and private message you for more details. Twitter – Tweet out that you’re offering a service like Lawn Care and to message you for additional information. Instagram – Post a beautiful picture of your favorite strawberry cake with a message that your followers can buy one for their very own. Community Boards – Great place to post your painting or wallpaper ads. Barber Shop – Get a man’s attention that doesn’t like tree trimming but needs it done. Libraries – If yours allows it, post your ad according to their rules and watch the jobs roll in. Sign in Your Yard – Put a Car Detailed Here sign in your front yard and you’ll see the traffic stop at your house for a car wash.
Word of Mouth – This is the best of all advertising because if you do a good job, folks might call you again. Do a great job and they’ll tell their friends and family to call you too. As with anything in life, use caution and practice safety. Don’t make promises you can’t keep. If the job gets too big, ask for help. Keep your eye on the prize because the potential to make big money at any one of these jobs is completely within your power. Do you do any of these side hustles? You can find more from Diona at Mommy Ways to Win! I’m trying 14 and 15! I’ve really enjoyed my first year of blogging and looking forward to greater success in my second year! I have had really good luck with selling items that I no longer need on a local community Facebook page. I also just recently started a blog, but wouldn’t exactly say that I’m earning extra income off it yet. I’m an avid baker and have always wondered what it would be like to have my own bakery. While I design blogs as my career, I still find myself thinking about selling my baked goods. Not for a career, but more as a hobby. I haven’t read it yet, but thanks for sharing the post from The Penny Hoarder. I’ve never actually taken the time to read tips for selling your baked goods. Great tips. As a blogger i just love this ?????? This is amazing content Im also doing blogging and succeeding it doesn’t take much to make some extra cash. definitely check out my blog by clicking on my name. Thanks for this post. Cleaning gutters is a great idea because it helps keep roofs in better condition. When you make your bid to clean gutters, be sure to mention that. I have had excellent luck with selling things that I no longer need on a local city Instagram. 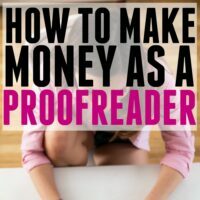 I also just lately started a blog, but wouldn’t explicitly say that I’m making extra income off it yet. Great great article. I love the enthusiasm at the beginning. We don’t need a four year degree! 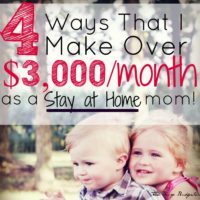 We can definitely work for ourselves and make the bigger bucks or the side dollar! Thanks for the list of 30 side hustles.